You may be wondering why the foilage on your favorite schrub or tree is being devoured. It’s never happened before, you think. So why is it happening now? 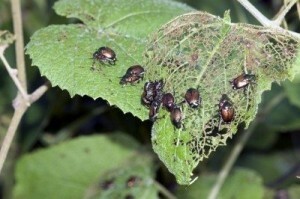 Well, the problem in most Miami Valley areas this summer is simply this…Japanese Beetles, a cyclical pest that every few years shows up from hatched larvae and lays waste to a variety of plants. Japanese beetles eat a wide variety of flowers and crops (the adult beetles attack more than 300 different kinds of plants), but they are especially common on roses, as well as garden beans and fruits like raspberries. They can devour most of the foliage on favored plants like roses. Look for leaves that are “skeletonized” (only have veins remaining). This is a tell-tale sign of Japanese Beetles. To get rid of them you can use beetle “traps”, but that’s not efficient; and if you choose to use an insecticide you should contact a county extension office, or, a landscaping professional with experience in trees and shrubs – like Ever-Green. You may remember them from the past, or you may never have seen them at all. But if you have Japanese beetles they can literally kill a shrub, plant – even trees – if they strip it of enough vital foliage (foliage is the life blood of a plant). To be safe, call the professionals at Ever-Green today. If you’ve already noticed the damage there is no ounce of prevention. What you need now is a pound of cure!